Petalite is a lithium aluminium silicate mineral (more simply a lithium feldspar) that is commonly used in clay bodies. It is valuable because it provides an insoluble source of lithium (lithium carbonate is soluble) and has the highest Li2O:Al2O3 ratio of any natural mineral. Lithium is a strong alkaline flux and is effective over all temperature ranges. It and imparts lower expansion and gives unique colour response to copper and cobalt in glazes. Some commercial versions have a chemistry that fairly closely matches the theoretical chemistry given here. Petalite is most prized for its mineralogical properties. It is especially valuable in imparting thermal shock resistance to clay bodies because it has almost zero expansion when heated above 700C. Bodies with 60%+ petalite can take a direct flame and rapid water cooling without failure. 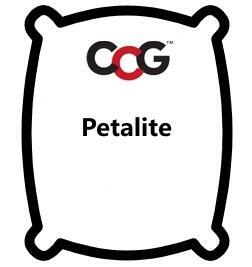 To make a plastic clay body mix petalite with as much ball clay as needed. For a casting body, use as much kaolin as needed to achieve the desired casting properties. Bentonite can be added to either type of body to increase the petalite proportion. Petalite can be used to create low expansion glazes. It is suitable for white and transparents as well because of the low iron content. It does not present the frothing problems sometimes associated with spodumene and helps improve brightness. One formula suggested by Val Cushing is petalite 76.9, talc 14.2, whiting 3.4, kaolin 5.5. This glaze is claimed to have an expansion of 0.8 x 10 -6 and fires cone 9 to 12 with a silky surface. Spodumene and lepidolite also provide insoluble sources of lithium. However, spodumene is more refractory, thus producing more porous fired results. If a body's range needs to be extended, spodumene can thus be added in preference to silica. Petalite is slightly more refractory than lepidolite. A petalite clay body can be made by combining petalite and ball clay or kaolin in proportions that provide a good compromise between high petalite content and necessary plasticity. Petalite promotes the conversion of the quartz form of silica to the cristobalite form. This has implications on the thermal expansion of the fired matrix.